In 1988, the Glasgow Garden Festival became one of the most memorable events in the city's history. From the roller coaster to Oor Wullie’s Garden, the Mctaggart and Mickel Broom Milk Bar, and the Clydesdale Tower, everyone who went along remembers something different. 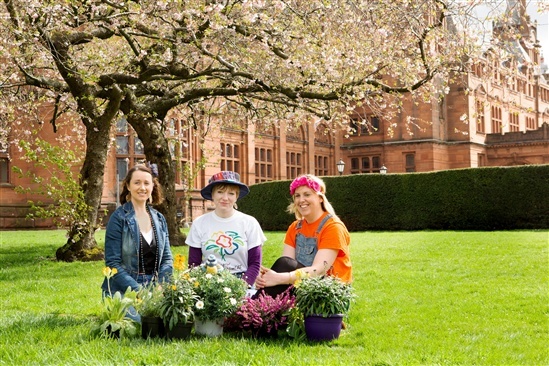 Now, 30 years on, RSPB Scotland in partnership with Glasgow City Council, are launching an exhibition at the Kelvingrove Art Gallery and Museum called Let Glasgow Flourish, to both celebrate the festival's legacy, and look at how environmental issues could influence city design in the next 30 years. If you were at the original festival, why not come along and share your memories. This weekend, we'll also be running a range of walks and themed activities for families, including face painting, seed bomb making and bag printing. The exhibition also launches this year’s Glasgow Wildlife Garden Festival, a summer of events and activities focused on the city’s wildlife and greenspaces. Now in its fifth year, the festival involves over 40 community groups, organisations and charities, which will be running a variety of events from now until September. These include art installations, wildlife walks and workshops, community fetes, and citizen science activities, and will take place in all sizes of green spaces from community pocket gardens, stalled spaces, back courts, church yards, schools grounds and parks. The main events will run in May and June, with each weekend focusing on a different area of Glasgow: east 12-13 May, West 19-20 May, south 26-27 May and north 2-3 June. For more information, visit: www.glasgowwildfest.org.